The resort features at this community make this home a great value. Emerald Island is one of the most desirable vacation home communities right beside Disney World. 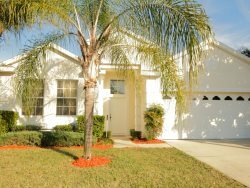 4 Bedroom/3 Bathroom Home with Private Screened Pool, Gated Resort Community, Two Master Suites, Soaking Tub, Washer/Dryer, Fully Equipped Kitchen, Free Wireless Internet, Expanded Cable, Close to Disney. A Disney entrance is only 3.9 miles away. Sea World, Universal, and the Convention Center are approx. 15 minutes beyond that. Our stay was great. The house managed the whole family and still gave us separation! We had an issue with the toaster, but it was replace immediately. We couldnt have asked for better service. Tony was quite patient with our booking requests and constant updates! When the opportunity comes up again, we will certainly be in touch! The first time we rented with FDH was in 1998 and every time we come back Orlando we do with FDH. Every time we were surpresed with the quality of houses and offered services. This time was not diferent, the house was fantastic, the condo was very nice, near of everything. My family and I loved our stay and certainly will recomend FDH for friends. Thank you very much for all FDH staff!! We had an amazing time in the villa - perfect location for everything and very comfortable. Having 4 kids this house was perfect for us. Lots of space and everything we needed at our fingertips. The staff at the office were very helpful especially since this was our first time in Florida. The kids really enjoyed being able to hop in the pool after a long day of walking, and we as parents really appreciated all the security features regarding the pool, it made for a lot of worry free evenings. Great location, great community, we would definately come back again!